Located in the medieval part of Siena, in the Salimbeni Square, the Grand Hotel Continental is the only 5 star Luxury Hotel in Siena. 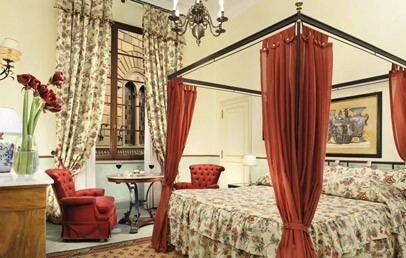 A few steps from Piazza del Campo (del Campo Square), the hotel is about 70 Km from Florence. Built in 1600, commissioned by Pope Alexander VII Chigi for his niece Olimpia on the occasion of her marriage, Palazzo Gori (which took its name from Giulio de Gori, husband of Olympia) became, in 1800, preferred destination of young aristocrats and intellectuals of Europe. Today the palace houses the Grand Hotel Continental, after a careful restoration that has revived the ancient frescoes and precious decorations. The 51 rooms at the Grand Hotel Continental, divided into Classic, Superior and Deluxe rooms, are luxuriously furnished with tiled floors, bathrooms in Carrara marble, authentic furniture dating back to 1800, prints and paintings of various epochs. Each room has a its own style, as a result of a succession of several artists in the history of the building, who have, from time to time, re-designed them according to their taste. The Restaurant "Sapordivino" of the Grand Hotel Continental will meet guests’ needs and tastes with its innovative dishes, which have their roots in the Tuscan tradition but have been reinterpreted with creativity and originality by the chef. To accompany each dish, guests can choose from a selection of wines of excellent quality. The “Enoteca ai Banchi" (the wine cellar) is perfect for those who want to taste the best regional wines with the right cheese and salami. Not to be missed is a visit to the esteemed "Enoteca Sapordivino", located at the base of the medieval tower, which boasts a selection of over 200 labels. For meetings and business meetings, the hotel offers 4 meeting rooms, equipped with modern technologies, which in total can accommodate up to 80 people. The ballroom, with its 100 sqm, is available for the organization of exclusive events.